The NT5 is RODE's premier small-diaphragm cardioid condenser microphone, sometimes referred to as a 'pencil mic'. 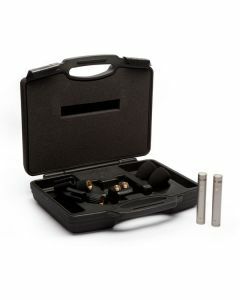 Intended for recording acoustic instruments, drum overheads, cymbals and live performances, the compact externally polarized mic employs a 1/2" capsule, an active J-FET impedance converter with bipolar output buffer. Expanding the NT5's versatility, an interchangeable omnidirectional capsule (NT45-O) is available. Finished in durable satin nickel, the NT5 available as a single microphone or as an acoustically matched pair. The NT5 is designed and made in Australia, and covered by RODE's industry leading 10 year warranty.